What is a respondent list? A respondent list is a collection of e-mail adresses or phone numbers of respondents that you want to send your survey to. In addition to just being a contact-adress/number it also holds information about respondents to give you an accurate database to create reports, filters and breakdowns. This information could include department, region or a customer number just to mention a few examples. The addional information in a respondent list is called Background data. To read more about how to create your respondentlist, click here. How do I add a respondent list? To add a respondent list you have two options, depending on the purpose of your list. These two options are either add it to a specific sendout in the distribution of your survey, or save it to your Netigate account to have the possibility to re-use the list on other surveys or sendouts. The most common need for a respondent list is that you only want to use it for one specific survey. In these cases you will need to create an e-mail, SMS or Login sendout in the Distribution page of your survey. To upload the list, go to the tab called Respondents and click the option Add File to select an Excel file that you wish to use from your desktop. When this option is clicked you will be prompted with a message explaining in short terms how the Excel file should look like. We recommend you to look through your file before uploading it to make sure the file matches the systems requirements, and that you do not add information that you do not need. E-mail/Telephone number should always be in the first column (Column A). There are no empty rows in the first column (Column A). The e-mail adresses are the correct format and do not include any blankspaces, ÅÄÖ or special characters (other than @). Phone numbers need to be with a country code and no blankspaces or special characters (46731231234). No hidden rows or columns in the Excel file. No unecessary formating or formulas in the Excel file. There is an option to upload a list to your Netigate account to have it stored and possible to re-use for multiple surveys. To do this you will need to be on the Home menu of the tool. In this menu you have an option called Lists & Data. 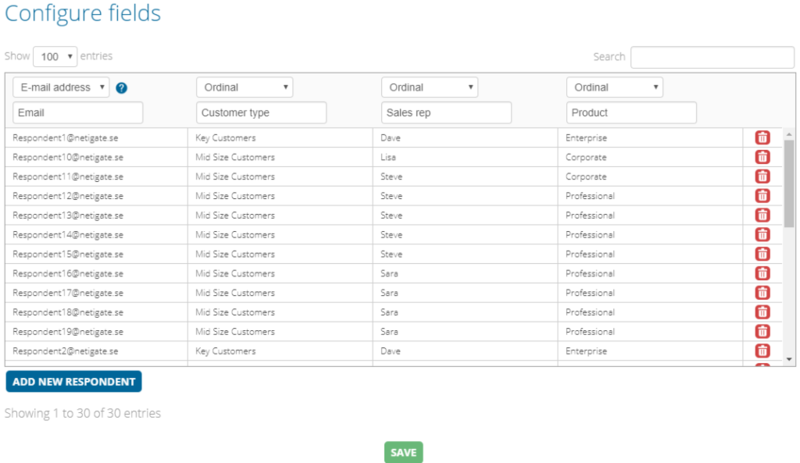 In Lists & Data you will see an overview of already stored lists, and give you the opportunity to create new ones by clicking Create. When a new list is created you will need to provide a name for the list. This is what will be displayed inside the tool, it will not be presented to any respondents or anyone outside of the Netigate platform. It is optional to add a description to the list. Once the uploaded list have been saved you will be able to review it at any time in this menu. To select a list you will need to create an e-mail, SMS or Login sendout in the Distribution page of your survey and then click Use a previously uploaded list to select on of the available lists in the drop-down menu. Once selected, you will be asked if you want to add a filter. The filter functionality gives you the opportunity to filter the list that you add to the sendout. For example you can select to only include HR if you have an employee list with background data for Department. This will only add the respondents that have the background data HR in your respondentlist. You can only use one respondentlist per sendout. In case you want to add multiple lists to a survey, you can do this by creating additional sendouts. When the Excel file have been uploaded you will get a setup screen for your background data. Here you will need to decide the type of data that is added in each of the columns, and how it should be presented in the Report if added. Ignore field: Will remove the column from the list. Textbox: Will make the background data presented as open text answers in the report. Ordinal: Will make the background data presented as a drop-down menu. Allows you to filter on the results in your report. E-mail adresses: A column marked with E-mail adresses will be used for sendouts. Only available through an E-mail sendout. SMS: A column marked with SMS will be used to identify phone numbers for sendouts. Only available through an SMS sendout. Logins: A column marked with Logins will be used to create login information for respondents. Only available through an Login sendout. 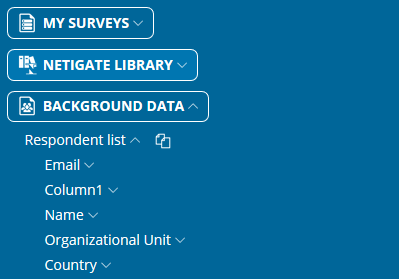 When you have uploaded your list it is connected to your survey and list your answers in the background data, but to be able to view the background data in your reports you will need to import the background data to your questionnaire. The background data needs to be added as questions in your survey in order for them to be viewable in the report. To do this you will need to go to Edit your survey and to your questions. In the left hand menu your have an option called Import. Click this and you will get a menu where you can import questions from a different survey, but also the option Background data. Click this to expand the background data options to see Respondent list. Under Respondent list you will see each of the uploaded columns in the Excel file that you have uploaded. If you click one of the options you will see a preview of the question in the pop-up window. The option that is visible in the question is the first option in the list. If you click the drop-down menu you will be able to view all the added options. Click Add to import the question to your survey. It will be added as the last question of the survey page that you are currently viewing. One it has been added to the page you will see it in the question list, marked with the text Background data in green. This is to display that it is a background data question and will not be visible for respondents. It does not matter if you add background data before or after the send-out. What is important, however, is that the respondent list has been uploaded for the survey and, ideally, contains all background variables. The import before the send-out is important when you want to base logic on background variables. If you add more background variables after initial import (e.g. country or language), you will have to delete the mechanism and import it anew to use it in the report. In this specific case, you can accept the warning message about the deletion of background variables, as the variables are still present in the list and can be reconnected. After you added the respondent list, you can finish your email message. Click twice on Next and activate the send-out. Your respondents will receive the survey via email at the set date and time. As soon as your respondents answer the first question, the background data will automatically be filled in and you can filter your results accordingly. You can create a new Excel file containing all new respondents and upload it. Please note that the columns must be labelled identically in both old and new file. You can add new columns but make sure to add them behind the already existing columns. You can upload the new file with the Add File button. Alternatively, you can use the same Excel file as for the first send-out and add new respondents directly in the same file. You can add new columns but make sure to add them behind the already existing columns. If you choose this version, please ensure to mark the checkbox Update existing respondents if matched as to not create duplicates of the initial set of respondents. You can also update or edit specific details of respondents. You can do so directly in your initial Excel list and upload it again. Please, again, mark the checkbox Update existing respondents if matched. By uploading the altered Excel file you will overwrite the initial file with the new updates. If you have added new variables (new column), please import it into your survey as well (s. above section Import background data to your survey) if you want to use them in your report section.